Want to know where to head for the best BBQ comps around the globe? Pack your bags and plot your trip – we’ve got the best of the best right here. Learn from the masters and sample the local delights. If you’re looking for one of the biggest BBQ competitions in the world, then you don’t even have to look past your backyard. Take a gander at the Blues and BBQ Competition that happens right here in Aus, in Port Macquarie. The weekend-long event features food trucks, bands, barbequing teams and more, and is one of the coolest BBQing events in the country. Check out the festival dinner, the barbeque wars, the blues and barbeque festival, and get ready to get your meat on. It’s Aussie barbeque at it’s finest, and you’d be a fool to miss out. Let’s face it: Americans love their BBQ too. While they might do it a little differently than us, they sure do know how to put on a show. And when you’re talking barbequing you’re talking the southern US. 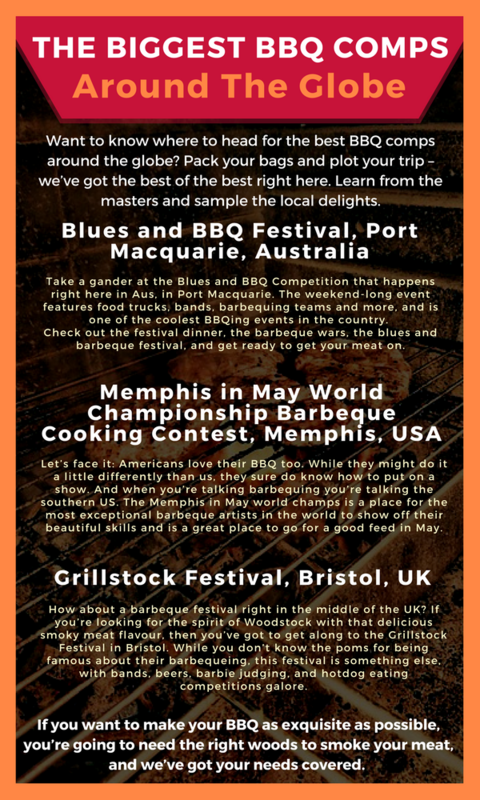 The Memphis in May world champs is a place for the most exceptional barbeque artists in the world to show off their beautiful skills and is a great place to go for a good feed in May. If you’re looking for the best of the best, then you’ll want to check out this event for sure. How about a barbeque festival right in the middle of the UK? If you’re looking for the spirit of Woodstock with that delicious smoky meat flavour, then you’ve got to get along to the Grillstock Festival in Bristol. While you don’t know the poms for being famous about their barbequeing, this festival is something else, with bands, beers, barbie judging, and hotdog eating competitions galore. It’s a little bit wacky, it’s a little bit weird, and it is a whole lot of fun and an excellent day out. Check it out for yourself. While we could go on and on about the biggest and best BBQ comps around the globe, what you can do for yourself is start plotting these major ones into your diary. If you fancy yourself as a whizz behind the grill then maybe one day it’ll be you up there mixing it will the best of the best of them. If you want to make your BBQ as exquisite as possible, you’re going to need the right woods to smoke your meat, and we’ve got your needs covered. Get in touch with us at Ample Firewood to learn more about the best woods for smoking your meat.